A) How much would the taxi would cost from Marbella bus station to Marriots Playa Andaluza and where would be get a get taxi from? “Hi Sam Thank you very much for checking into Gomarbella and for reading the blogs. 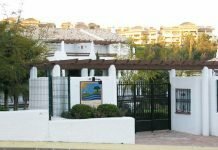 Have a look at this blog and the other one on Marriotts Playa Andaluza which also tells you how to travel all the way from Malaga Airport to the resort by public transport. 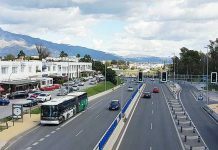 Check out the link which gives information about the all the bus stops between Marbella and Estepona and you’ll see that the Isdabe bus stop is the closest to Marriotts Playa Andaluza in the Estepona area. because of the proximity of the pedestrian overpass next to that bus stop. I took the photo above standing on the overpass at the Isdabe bus stop. You can see Marriotts Playa Andaluza in the distance on the right hand side of the photo just above a flat topped building. The surface for pulling a suitcase is good all the way. It must be at least 800 metres to the complex from the Isdabe bus stop and the overpass. If your son is feeling tired at that stage after your plane flight to Malaga and then the bus journey to Marbella, he won’t feel like walking! “Hi Mike Thanks for your response. Very useful. I was just looking through again the list of bus stops from Marbella to Estepona and comparing it with the Google map. 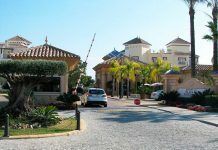 I thought PLAZA ORTIZ may be the nearest stop to Marriott Playa Andaluza. Or have I got my geography completely wrong? “Hi Sam Thank you for your reply and your kind words. Much appreciated. Try getting Google maps up and typing in atalaya-isdabe you should see the name near the sea. This is the Atalaya hotel in the Isdabe Urbanisation. Your bus stop is at the end of the orange section of the road, just past the A7 sign. Over the road is the Centro Comercial Diana. Marriots Playa Andaluza doesn’t show up but it is just to the left of the Atalaya Hotel. The bus stop is the Isdabe bus stop. I hope you have a good trip, the weather is very changeable at the moment, warm, cold, windy so bring something warm to put on as well! Having just used public transportation from Malaga to Marriott's Playa Andaluza, I wanted add my two cents. If you are somewhat confused, as I still was after having read all the above, the gist is this. You have 2 options: take a bus from Malaga to San Pedro de Alcantara and then a 5 min taxi costing about 10 euros, or, take a bus from Malaga to Marbella, and then a different bus to Isdabe and walk from there. We opted for the first hoping to avoid dealing with the transfer, but the 2nd option would have been the cheaper and faster option. Just make sure you get on the direct bus from Malaga to Marbella. Live and learn. Hi Liam, excellent question thank you for asking it. Coming by bus from Malaga airport you will have changed buses at Marbella bus station and now be on the bus from Marbella to Estepona. 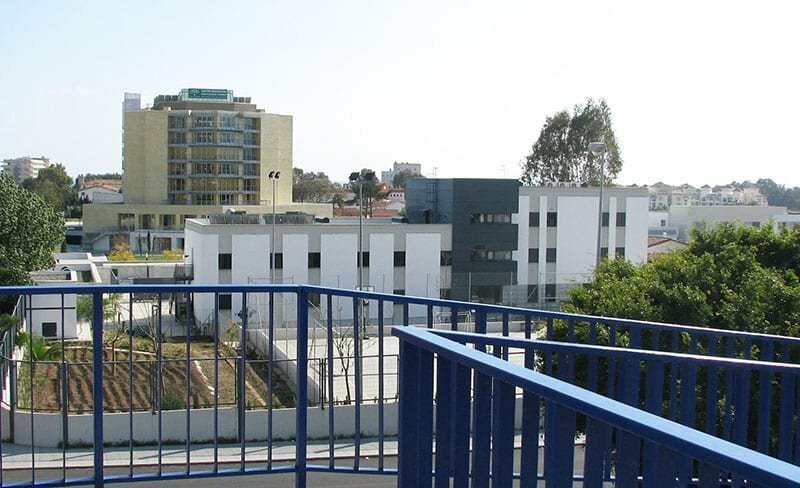 It will pass through Marbella centre first, you know you are in the very centre because you'll see the green leafy Alameda Park on the sea side of the road. Make a note to come back and explore the old town. The bus then heads off on the long straight road out of Marbella towards Estepona. You'll see Puerto Banus behind the big El Corte Inglés building on the left, come back to shop and look around, remember to bring your gold credit card. Now you are heading towards San Pedro de Alcantará. Ahead of you you'll see a double road tunnel. The bus will pull off to the right of the tunnel and then stop a few hundred metres further on at the San Pedro de Alcantará bus stop. The Isabe stop is the second stop after the San Pedro bus station. The first stop is the Gualadmina Commercial Centre, a long building on your right. Then the bus crosses a small bridge and does a tight right hand turn. Press the stop button at the same time as you see the Isdabe pedestrian road bridge in front of you. There'll be other people getting on and off the bus, it's usually a busy stop. Use the foot bridge to cross the road. From the footbridge you can just make out the Marriotts Playa Andaluza buildings. 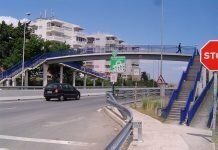 Oh, coming back the other way from Estepona towards Marbella, you'll see the Isdabe stop footbridge at the end of a very long straight giving you lots of time to organise your shopping bags. I am sure you will have it sussed after your first trip to Isdabe on the bus from Marbella. Having never been here before, how would we know (when on the bus) that we were had reached the Isdabe stop, when getting around by bus? The Hacienda del Sol apartments are just off Calle Campo de Luna, so if you could let me know based on this info that would be great. Mike, thanks for your help in getting to Playa Andaluza. We actually took the bus from Marbella bus station( after taking the AVE from Madrid & bus from Malaga bus station) all the way to Isdabe stop (2 stops West of San Pedro stop) and then just crossed the pedestrian bridge and walked to the hotel. We each only had one small rolling suitcase and one carry on back pack. Have been taking bus all week. Hi there, thank you for writing in. Yes, you can take a taxi from Malaga airport if that's where you are arriving, to Marriotts Playa Andaluza or you can take the airport bus shuttle bus to Marbella and a taxi from there to the resort. You can also even take a second bus from Marbella to San Pedro de Alcantará and take a take a taxi from there which is even closer. Hi Sam , We have reservations at Marriott's Playa Andaluza in June . Is it easy to find a taxi to reach the resort and if thats the most convenient and safe way to do it. Hello Susana, apologies for the delay in replying. Unless your travel agent can do the combined train and bus tickets for you, I would book them separately. There is no way that I know of that a visitor to Spain would be able to combine those two journeys. The bus trip from Malaga bus station (which is right next to the Maria Zambrano main train station in Malaga) to Marbella , you can easily book on the Gomarbella bus booking engine right here. You will be travelling from Madrid on the AVE, Spain's pride and joy and it is never late. Give yourself half an hour after the train's arrival in Malaga, for your earliest departure time from Malaga on the bus. This is ample time in to walk across to the bus station and pick up your bus to Marbella. to avoid pulling your suitcases the last 800metres to the resort. I think it will be a good investment. If you want to go as far as you can, then it's the Isdabe bus stop where you need to get off for Marriot's Playa Andaluza. Have reservations at Marriott Playa Andaluza from March 23 to 30. Need to buy train and bus tickets from Madrid to get us to hotel. Trying to decide since date is a Sunday if better to buy a combined Marbella bus ticket and then get a bus from Marbella station to hotel or buy a train ticket to Malaga and then purchase a bus ticket from Malaga ? Want to avoid taxis if possible and by tickets in advance once we arrive in Spain. Will appreciate your help. Hi Liam, the Isdabe bus stop is the stop that does Marriot Playa Andaluza so it must be your stop for Hacienda del Sol Apartments. The apartments come up wrongly placed on Google, but if you can give me a street address, I'll tell you how many minutes it will take on foot. I've just phoned the Marbella Taxi company and a taxi from Marbella bus station to Marriot's will cost 10 to 12 euros during the day, (2014) after 10pm and at weekends it'll cost 3 to 4 euros more. I was surprised at that price, I thought it would be double so keep a few extra euros on hand. I am staying at the Hacienda Del Sol Apartments in July and was wondering if it is the Isdabe bus stop that is closest for us too? Also, how much would a taxi be from Marbella bus station to the apartments? They are near the Marriott Playa Andaluza, if you don't already know where it is. The bus service up and down the coast between Marbella and Estepona is great for getting around without a car. But buying a ticket is always a pain. Are there any day/week passes or books of tickets available? Sincere apologies for not replying earlier, your email slipped down in my inbasket. Can you tell me where on the Costa del Sol you might be staying? It will help me answer you better. Your car rental is very easy, just go to http://www.gomarbella.com and use the car rental search engine box that you´ll find. You'll get the best car rental offer available without losing time searching through lots of different sites. When are you thinking of coming? I'm sure it'll be next year because you mentioned the beaches. Right now, they are rain washed and cold, lovely to walk on for exercise but no one is swimming at the moment! Please give me a few more clues and I'll be pleased to help you. Best wishes from Marbella and thanks again for writing in. must know for car rental.